Amongst all the huge boulders and the crumbling ruins of ancient structures at Hampi rises a single tower which seems almost unscathed. 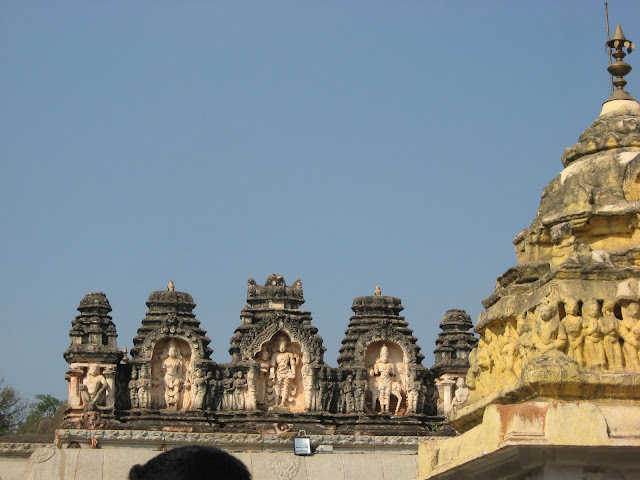 This is the gopuram (tower) of the Virupaksha temple. 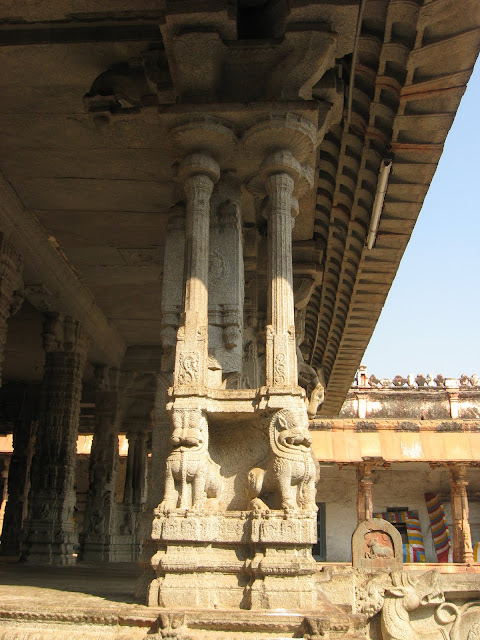 Virupaksha or Pampa-pati as Lord Shiva is known here, was the patron deity of the Vijayanagara rulers, and it is perhaps fitting that this is among the few temples where prayers have continued, uninterrupted by the centuries. 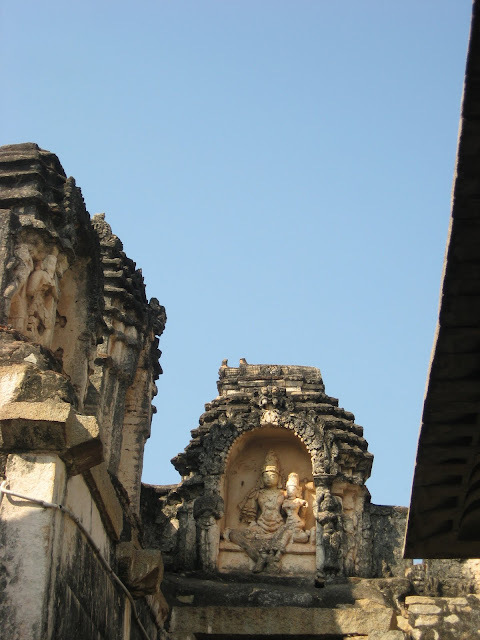 According to the ASI guidebook, the tower and the temple date back to the early 15th century, but repairs and extensions were carried out in 1510, during the reign of Krishnadevaraya, probably the most famous among the Vijayanagara kings! Further renovations have been carried out over the years, but the basic structure has remained! 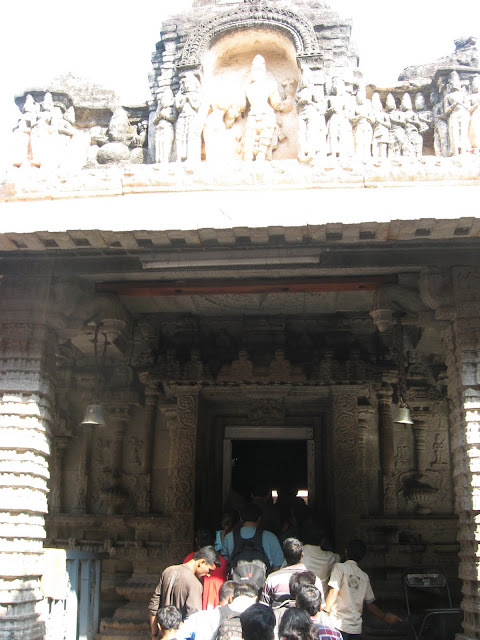 While the guidebook gives no explanations for the temple escaping the havoc wreaked by the invaders, we heard a number of interesting reasons from people. 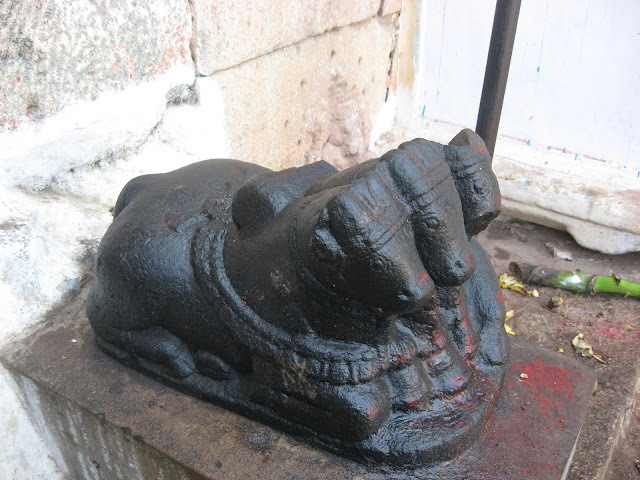 While most were of the opinion that the invaders did not consider a lingam to be a form of God, and thus did not bother to deface it, there were a couple of people who even told us that the Lord did not allow his abode to be destroyed! 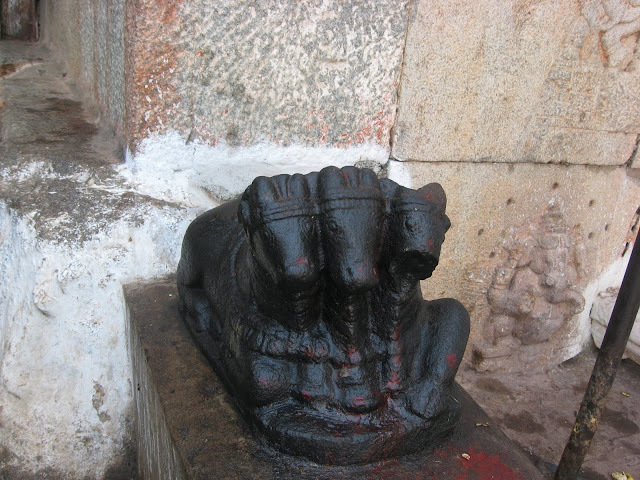 The first opinion does not somehow seem feasible, for Lingam worship was nothing new then… in fact, lingams had been worshipped for centuries, and it seems unlikely that the invaders, even though Muslims, were so un-informed that they did not realize this. 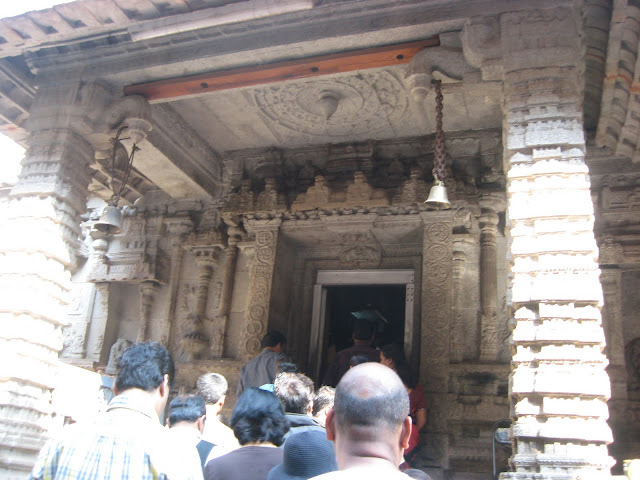 The second opinion is typically Indian, and in fact, is what still draws crowds to the temple! It is probably what has kept the place from falling apart, and people have come here to pray, even when the place was deserted! Such is faith and belief! The story of the temple is an interesting one. 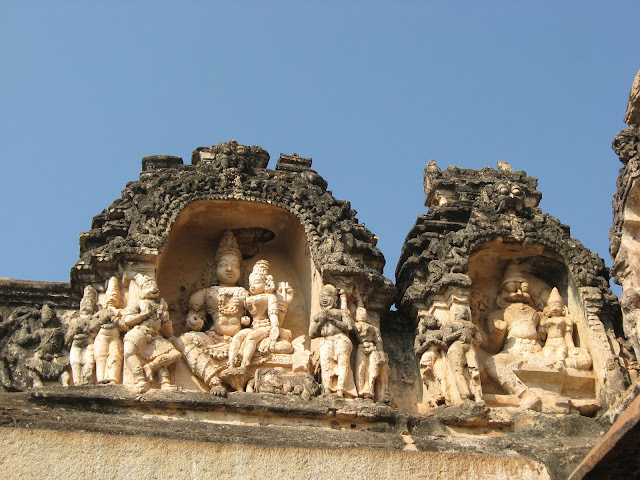 It is believed that Parvati was born in this region as Pampa (incidentally, the river Tungabhadra was then known as the Pampa, and the city was first called by the same name, but was later corrupted to Hampi). She wanted to marry Lord Shiva, who was deep in meditation on the Hemakuta hill, which is right opposite the present temple. She realized that meditation was the only way she could win him, and proceeded to do so, on the banks of a lake on the other side of the river. There is now a small temple there dedicated to the goddess, with the lake named after her, as Pampa Sarovara. Finally, Shiva became aware of her, and agreed to marry her. 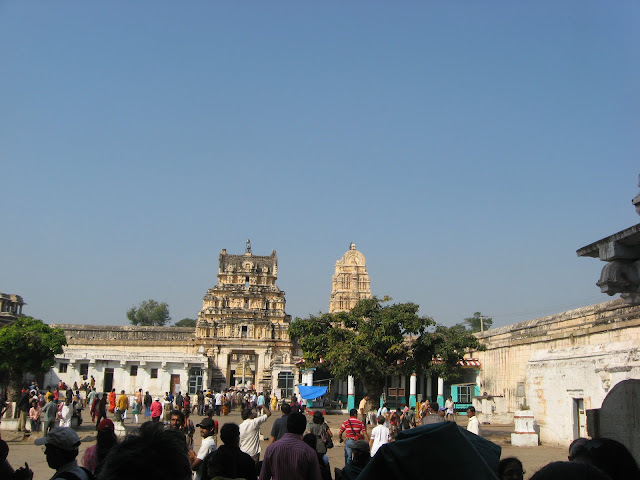 The location where they were married is where the Virupaksha temple stands today. 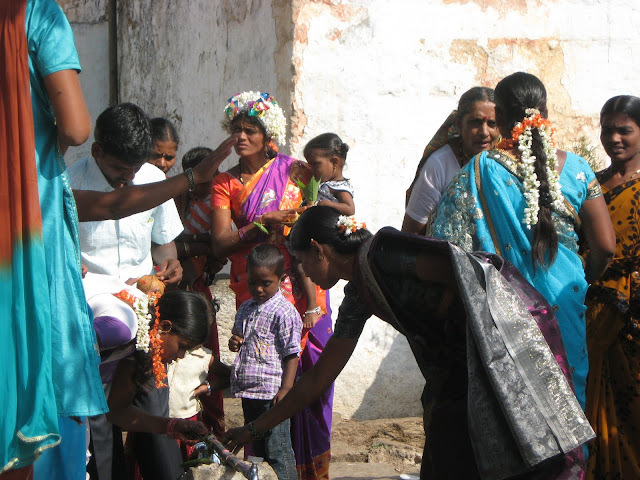 Even today, villagers from the surrounding areas prefer to marry within the temple premises, considering it an auspicious beginning to their married life. One such couple arrived in the temple just as we were leaving. I wished I could stay back and see the ceremony, but unfortunately, our schedule was packed, and our guide hustled us out. I just managed to get this one shot of the bride before I left! Preparation for married life? The bride amidst a crowd of people, kid in her hand! And yes, she certainly is the bride. I asked! The road to the temple was lined by shops. It was once the place where diamonds were traded, and today, tourists are sold knick knacks made all over the country! But more about that later…. As we approached the temple, we were besieged, not by flower and puja-material sellers, but by banana sellers! Bananas? Why Bananas? 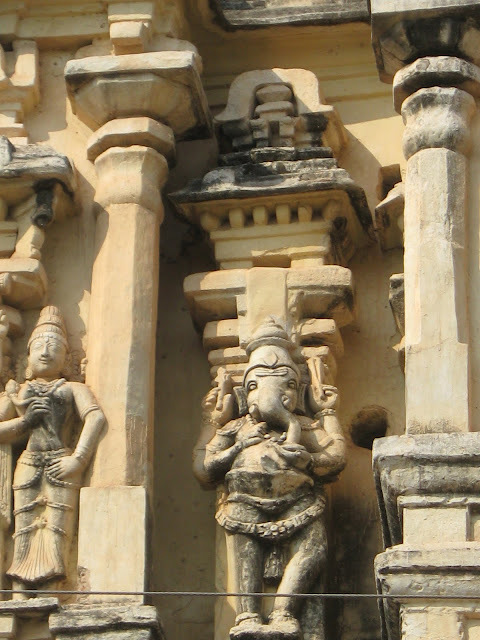 “For the temple elephant of course!” replied one of the women. There was pandemonium as all the kids began haranguing their parents for bananas, Samhith among them! I tried explaining that the elephant would probably have had enough of bananas by now, but it didn’t seem to make any sense to Samhith, and I decided that it would be easier to get him the bananas, rather than having him tugging on my arm, not allowing me to take photographs! 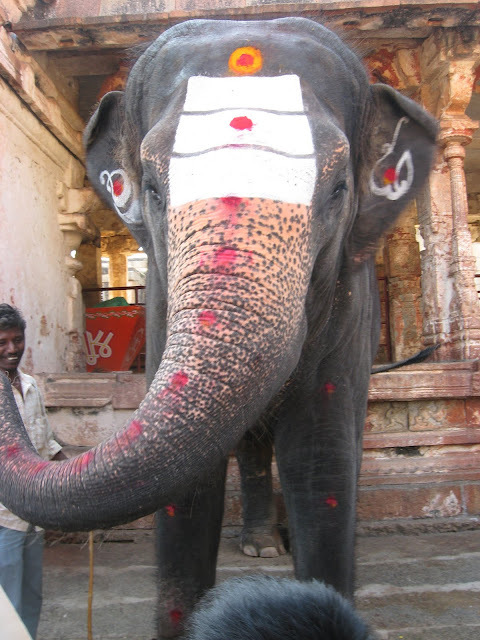 Lakshmi the temple elephant - the star attraction! As it turned out, the elephant didn’t eat the bananas, and the mahout insisted on money to get the elephant to bless the kids! There were more people gathered around the elephant, than those looking at the temple, so I took the opportunity to take a few pics in peace! 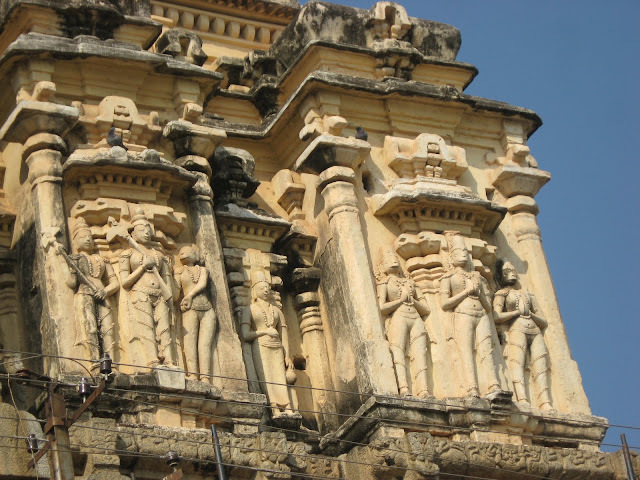 Don't these figures on the Gopuram resemble the statue of the king, Krishnadevaraya? 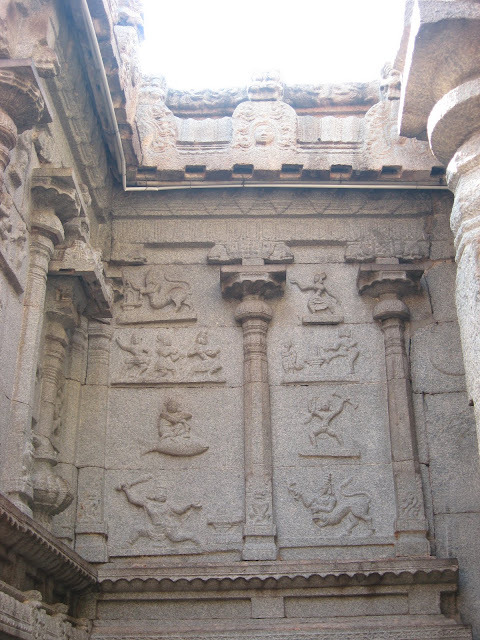 Interestingly, all these figures depict the many forms of Vishnu. And this is a Shiva temple! The temple is huge, and takes quite some time to look around. It was packed with tourists and pilgrims, being the Christmas vacation, which is a wrong time to visit. You should plan a trip when schools are in flow, for that is the only time you can actually see the place. As it is, with the crowd, and our guide hurrying us on, we missed quite a few interesting things in the temple. Here is some of what we did see….. 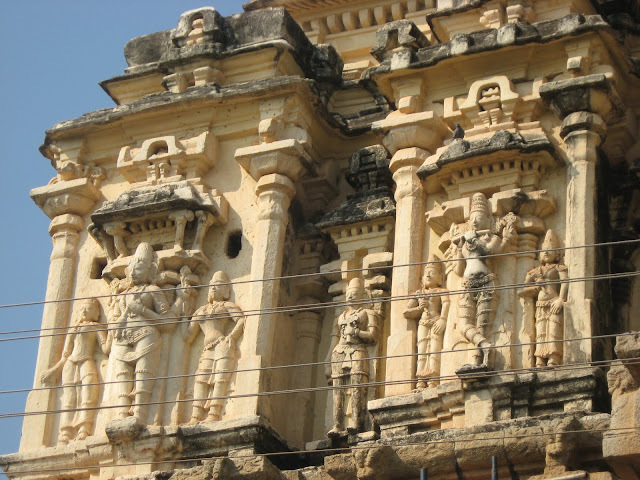 The main sanctum is dedicated to Lord Virupaksha, and the mandapas have some wonderful works of art. Unfortunately, the crowd did not allow us anything more than a glimpse. As I said earlier, make sure you go on working days, or wait till the crowds leave! One thing we missed is the pin-hole camera in the temple. In the rear portion is a dark chamber with a slit in the wall. 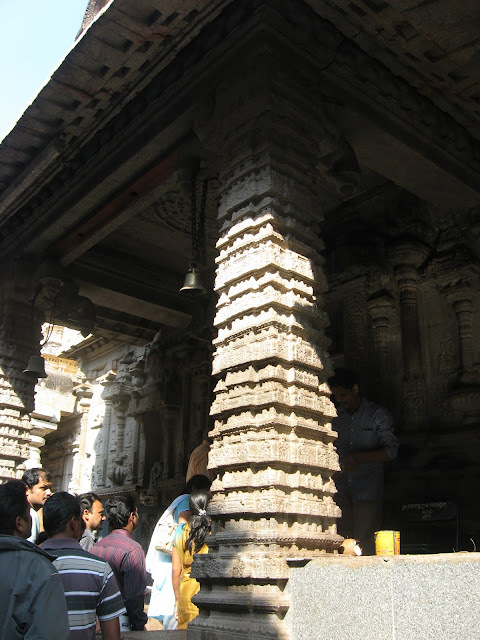 Light enters in such an angle that an inverted shadow of the Gopuram is projected on the wall! We missed this, thanks to the crowd and the rush. 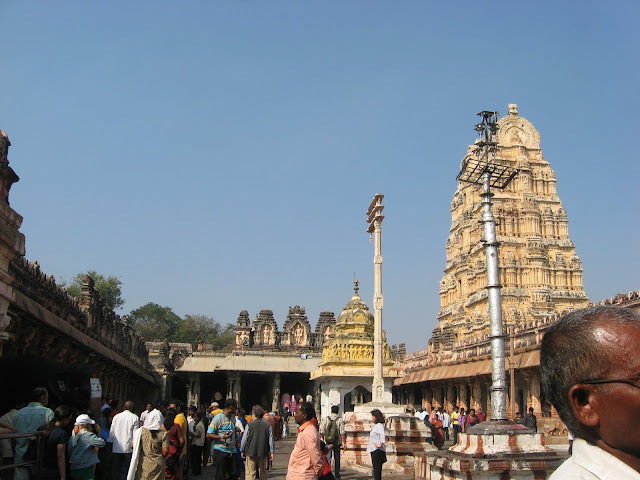 Apart from a sanctum of Pampa Devi, the consort of Virupaksha, this temple also has a sanctum to Bhuvaneshwari. Literally meaning the goddess of the world, Bhuvaneshwari is also the goddess of good fortune. When I asked why the Devi had a separate sanctum here, our guide just told us that it was probably to ensure good fortune! Unfortunately, no other answer emerged, and I am as clueless as ever! It is believed that if you can span the centre of this flower with both your hands, and make a wish, the wish comes true... dont know if its true or not, since I couldnt span it with my tiny hands, and Shankar did not even get an opportunity to try! There were too many people wishing hard! 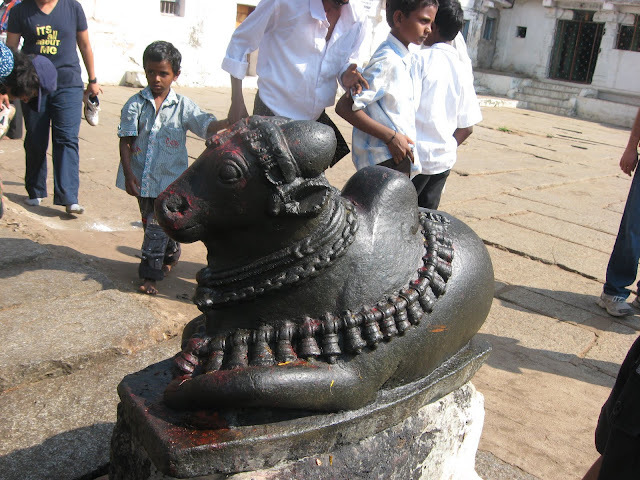 We were on our way out when we noticed this rare 3-headed nandi just inside the gopuram. I have never seen anything like this. It was slightly broken, which explained why it was outside, instead of being right outside the main sanctum. The book stall outside the temple is a good place to find some interesting reading material on Hampi. 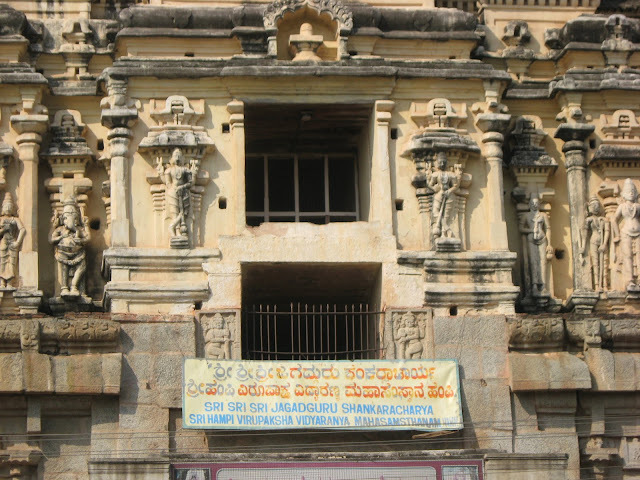 Apart from the ASI guidebooks, they also had a few books on Hampi written by foreign visitors over the years, as well as relatively old texts of use to people doing serious research. I seriously debated buying a few, but then decided that we had a long journey ahead, and it would be better not to fill my bag with books at our very first halt, and stopped myself! 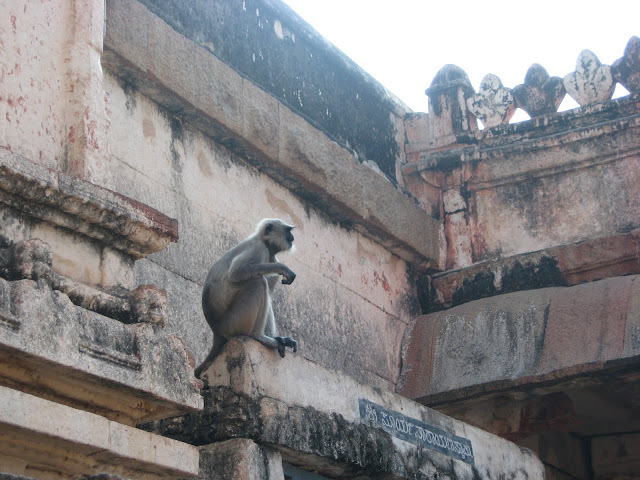 This was just our first point of halt on our Hampi tour, so you can guess that we have a long way to go. Keep coming back for more! Excellent write up. 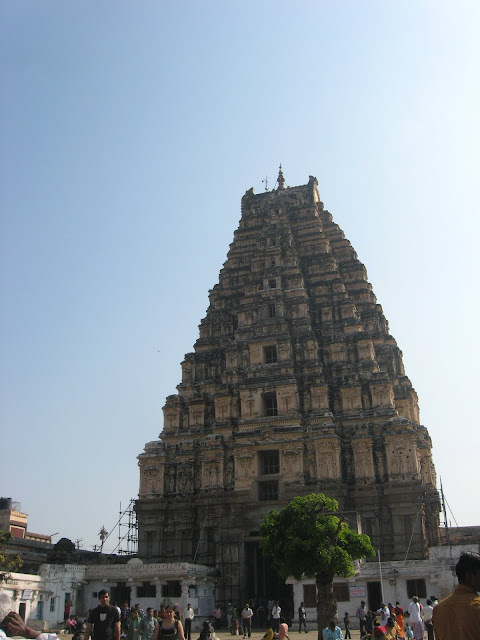 I went to Hampi recently and this definitely is a good time to go there, wasn't as crowded as your photos show. After reading your blog, I wish now I had hired a guide as well..Or maybe I'll just read the remainder of your blogposts on Hampi. Nice blog thanks for sharing. 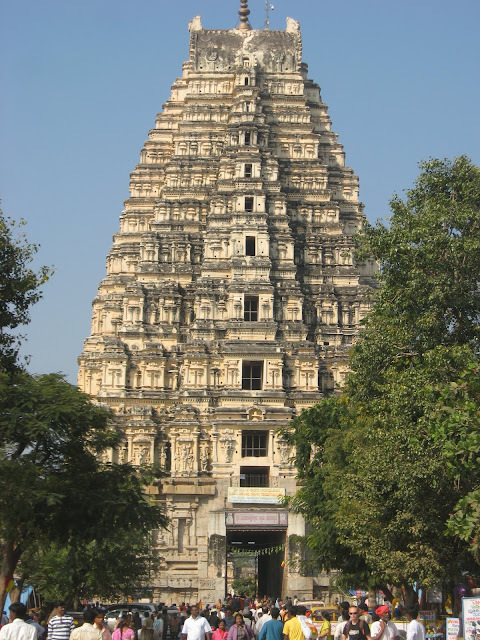 This is really great and very informatics blog, Hampi, Karnataka has ranked among the top 5 tourist destinations in India,Hampi is regarded amongst the topmost rock climbing destinations in India. 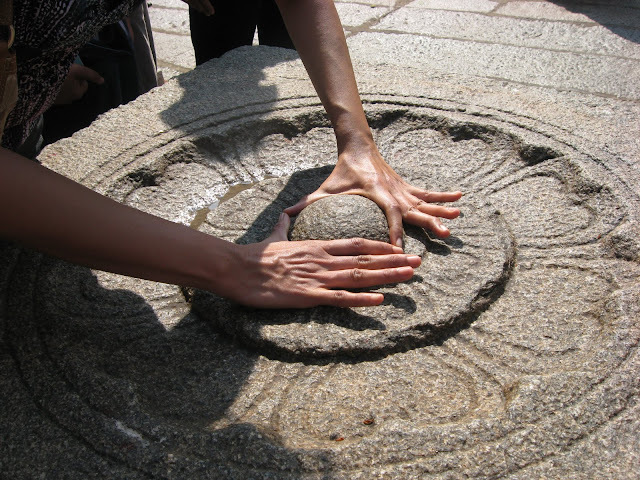 Nice post on great information, i was looking for the same for my coming tour to Hampi with my friends. Thanks and keep updating.